Quite a while since I’ve been writing…a lot of water under the bridge and a demanding yet rewarding job in Zurich are some of my excuses. Expect a lot of learning, networking and community involvment. Keynote will be by Joseph Sirosh and Troels Petersen and we’ll also have track specific keynotes to start up the main conference with speakers like Mark Souza, Matt Masson, Lindsey Allen, Rafal Lukawiecki and Ragu Ramakrishnan. If your company has an agreement with Microsoft about Premier Support, you can use this agreement to pay for the conference fee. The guys from the SQL Server User Group in Denmark have also been working hard to build a community zone worth a visit. 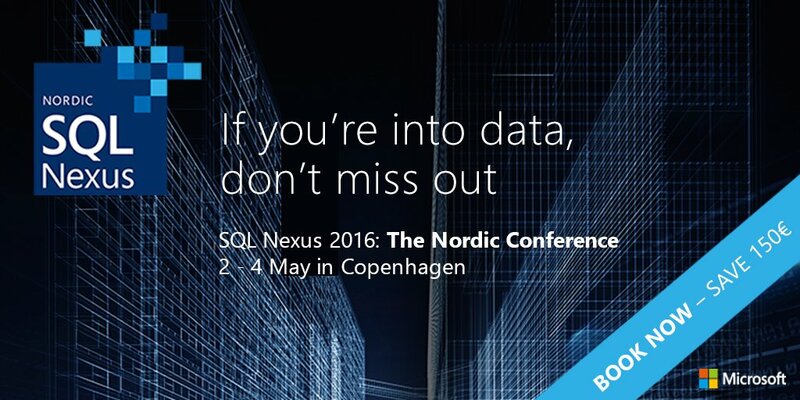 There will be rich possibility to meet and speak with speakers, participate in quizzes and network with fellow SQL Server pros. If you have logistic problems for joining the conference, the community has also arranged a SQLCouch service (the T-SQL version of AirBnb) and a SQLDrive service (Uber without the police harassment). Make sure to visit their Facebook page for more information. The CZ will have some guests from PASS for any community related questions, so make sure you stop by and have a chat with Karla and Georgia.